Listen to me, Women: You’re not crazy. The narrative about us makes us feel crazy by incessantly focusing on our problems in a way that makes them sound insolvable. It’s a miracle if we don’t fall into despair or rage. No wonder we may feel immobilized by the messages telling us we’re damned if we do and damned if we don’t — insert the behavior of your choice here. The truth is just the opposite of the messages we’re getting in the narrative about women, power, and leadership. 1. This article on LinkedIn entitled “All Career Advice for Women is a Form of Gaslighting” is easily the most unhelpful I have read in a long time. It rails against the advice machine that tells us we must change ourselves, but doesn’t tell how to shut it off and retool that machine. So it stokes anger and despair but fails to offer solutions that could get us off the catch-22 gerbil wheel where the victims of implicit workplace bias feel blamed for not advancing to their full potential. What better way to make women feel powerless rather than helping them feel powerful? 3. 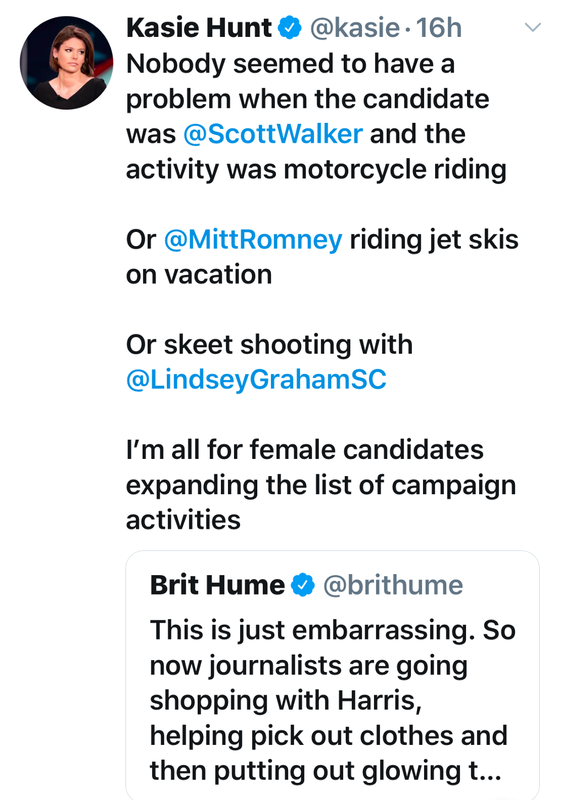 Then there is the Kamala Harris shopping drama, spun so as to define as frivolous reporting on a sport many women enjoy — shopping, and especially shopping with purpose to help social causes — whereas apparently journalists participating in and reporting on “manly” sports enjoyed with male candidates (John Kerry windsurfing — really?) are serious business. 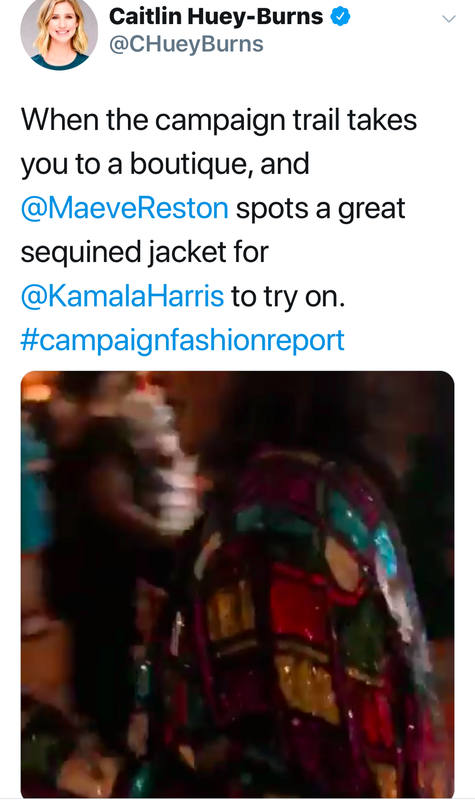 These two twitter threads show the ridiculousness of the attack by people who want to keep women down on @KamalaHarris for trying on a sequined jacket at a boutique that raises money to help women raise themselves up. Systemic change is absolutely needed. But we won’t get there by railing at the system. The steps are simple but not easy, as I describe in my own Leadership #Power Tool 7, Create a Movement. It takes finding your sisters and brothers who share your concerns, having the courage to raise the issues with decision makers, and putting those together with the facts and a strategic plan for change. Then execute on the plan and stick with it until the change is ingrained in the culture. But most of all, it takes changing the stories in our own heads. I’ve started focusing increasingly on showing women via the data what this implicit bias does to our heads. Once we know that, it’s defanged and loses its power to lower our confidence. And we can move on to both short term situational solutions and longer term systemic changes. Information has its own power. Quantifying discrimination can motivate companies to change hiring policies or politicians to change laws. But that wasn’t the headline. And the headline is what frames and shapes our thinking. It’s what most people will read and retain. 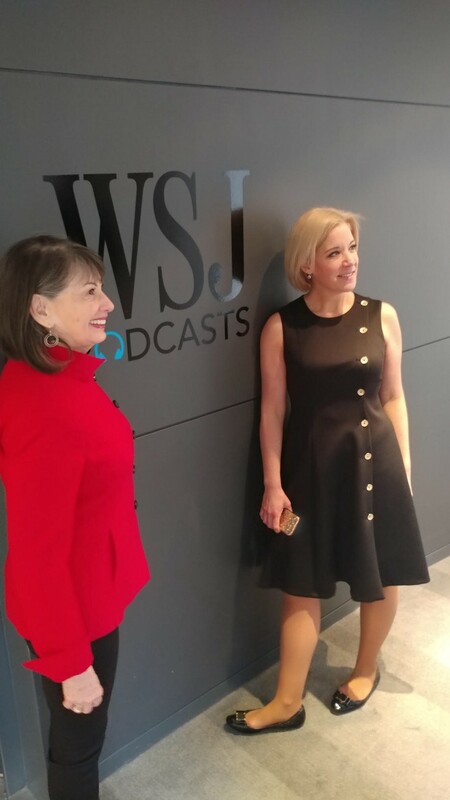 Speaking of serious business, I had the pleasure of being interviewed by the Wall Street Journal’s @VeronicaDagher for her popular podcast “Secrets of Wealthy Women.” I shared that social capital is as valuable as financial capital. We do have to face the fact that women have been stuck at under 20 percent of top leadership positions across all sectors but not let ourselves be defined by it. 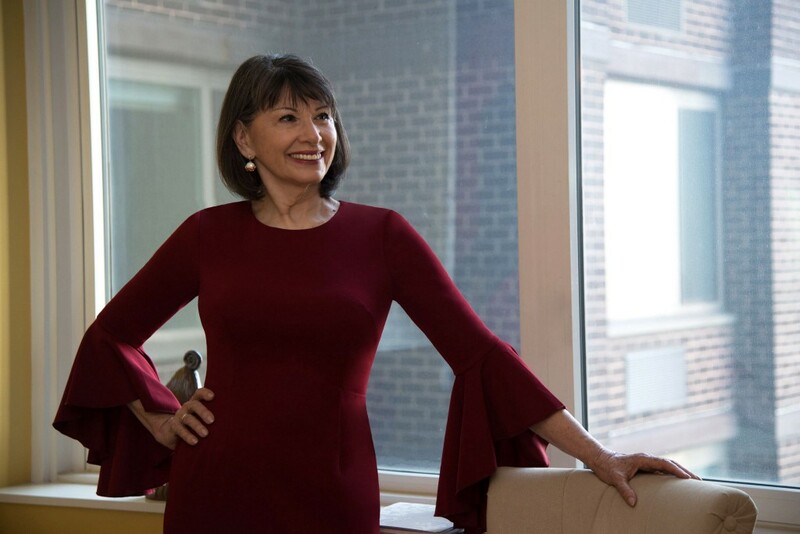 Shifting the narrative would foster a new wave of breakthroughs that can help catapult women to leadership parity by 2025. After all, women have the purchasing clout of 85 percent of consumer goods sold, constitute half the workplace and 54 percent of the voters, and earn 57 percent of college degrees. Gender parity is supportable both for the business case and the justice case. The problems have been researched and documented ad infinitum. We can continue to rail against them and get the same results. Or we can create a new, positive and solution-focused story about how women can achieve parity, and barrel right on through to make breakthrough progress in the 21st century just as the second wavers did in the 20th. Power and energy come from going into new spaces, not from standing still or remaining mired in half-century-old tropes. It’s a difficult shift to make for three reasons we must understand if we are to change them. First, persistently telling women that the workplace is rigged against them becomes a self-fulfilling prophecy. Second, when you fight an adversary for a long time, you can become its mirror, locked into a Kabuki drama from which it is hard to extricate your mind. And third, at some level, we’ve been co-opted into the culture of oppression, become drunk on the nectar or righteous indignation rather than basking in the adrenalin rush of finding solutions and making change happen. Culture eats strategy for lunch. We all know that famous Peter Drucker saying and it has its merits. Resisting change is a rational way we keep our minds and society orderly. But we can also disrupt a culture. In fact, it’s constantly being disrupted. So let us disrupt it consciously, intentionally by giving light and voice and praise to those who are making the change. 1. Change starts with what’s in our own minds, the stories we tell ourselves about ourselves. So repeat often (in a cadence like Dorothy’s “There’s no place like home”), “There’s nothing wrong with me.” Once you’ve done that call up the admonition that whether you think you can or think you can’t you are right. 2. Next, let’s intentionally spend more time applauding the companies like Salesforce that closed its pay gap and sharing how they did it. Let’s give the ink and airtime to companies like Accenture and Medtronic that repeatedly rank at the top of the lists of companies best for diversity. Best for hiring and retention of women, people of color, LGBTQ, and people with disability. Best in percentages of women in executive leadership and boards. And how female entrepreneurs are driving economic growth globally and leading the way in the nonprofit and social profit sector to make the world a better place. 3. Talk with your friends and work colleagues about how the data finds that companies with more women in leadership roles make significantly more money and why. Remind them that, as the McKinsey study states, “Women are doing their part. For more than 30 years, they’ve been earning more bachelor’s degrees than men. They’re asking for promotions and negotiating salaries at the same rates as men. And contrary to conventional wisdom, they are staying in the workforce at the same rate as men.” If politics is your passion, refer them to Linda Hirshman’s data-rich article defanging the notion that Americans aren’t ready to vote for a female president. 4. Exercise your own thought leadership. Share solution-based articles and facts on social media. If you blog or are a journalist, tell the stories of how and why there are benefits from diversity including gender parity. Those might not be the click bait man-bites-dog stories, but they are the stories that will change minds and the world. This is just because I love @AliciaKeys and this red dress. Yes I own loving fashion as serious business. This is 2019, people. The old narrative no longer works. It’s time to change that negative focus on counting up today’s problems to a vibrant positive story that defines solutions for tomorrow. Women will reach leadership parity if we think we will and set about making those systemic changes that will make it so. So let’s shift to a new vision of what is possible, what is necessary for the continuing advancement of women to full equality, and how it can be done. Let’s start from a position of believing we deserve it and create a new narrative based on the possibilities for solutions with which we can shape a future where all women and men can thrive. Let’s embrace wholeheartedly this truth: we’re powerful as hell and we’re going to take our rightful place in politics, work, and personal relationships now and forevermore.